Product Information Film "BMW 850i"
Director/cameraman Siegfried Steiner. Frame grab from VHS tape. It is certainly always interesting and in a way also complimentary for a filmmaker to shoot a commercial or product film about a world innovation. If, however, this film is produced with the help of another world innovation, this can be called a very exceptional incidence. In this case, the film-maker was Steiner-Filmproduction, Munich. 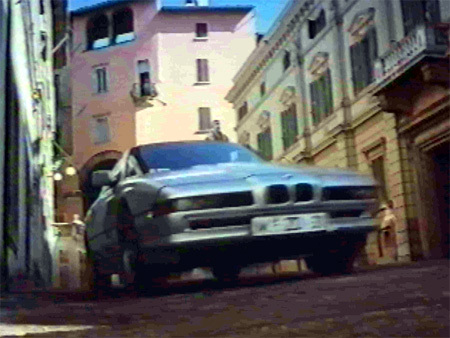 The world innovation which was the topic of the film is the present BMW flagship: the 850i. And the world innovation which was used by the director/cameraman Siegfried Steiner for shooting the film was the ARRIFLEX 765. The following report is about the experiences with so much new. The problem was twofold: On the one hand a product information film about the 850i was to be produced with a running time of about ten to twelve minutes. The purpose of this film was to give more detailed information to dealers and customers who had already ordered this vehicle, so to speak a little compensation for the long waiting-time of almost two years until delivery. The second part of the problem was to produce an exhibition film about the sportscoupé for the IAA (Internationale Automobil-Ausstellung) in Frankfurt. The length of this fascination film should be approximately four minutes. Originally, the 35 mm-format was discussed. However, Siegfried Steiner had wished for a long time already to shoot a 70 mm-Showscan-film. So this was his first idea when he was approached by BMW in 1988. However, since the special venue movie theatre where this Showscan film was to be screened was not ready by then, he dropped the realization of the "70 mm-idea" for the time being. Nevertheless, this exhibition film was meant to be something extraordinary, equal to the extraordinary automobile. 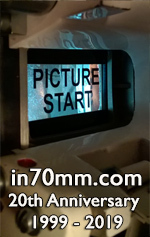 And at last it was there again, the "70 mm-idea". Siegfried Steiner: "The format plays an important role with a film". A year before he already shot a production film in CinemaScope about another model of the same company. This film turned out to be a big success: It was found out that this widescreen-format was especially suitable for an automobile production film. So he proposed to BMW to shoot the exhibition film in the 70 mm-format. The advantages for such a decision were quite obvious: More light-output, a sharper image, larger screen, etc. The automobile manufacturer agreed enthusiastically. At that time it was not yet known at Steiner-Film that Arnold & Richter had already finished the development of the ARRIFLEX 765. By accident they learned however about the latest status and so they came knocking at ARRI's door. After agreement had been reached about all arrangements, the ARRIFLEX 765 could start its first assignment. BMW 850i. 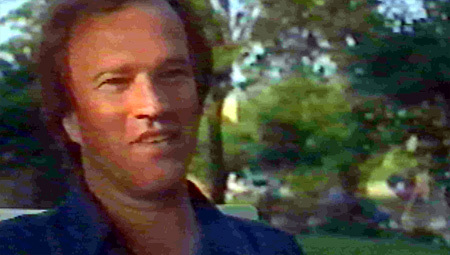 Screen grab from VHS tape. BMW looked at their product in a way of being "Italian"-orientated. Apart, in 1938 two BMW-models won the famous Mille Miglia in their class; so, the film should also have an Italian touch. Therefore it was finally decided that the topic should be the Mille Miglia, however, from a scenery and culinary point of view. Speed was not in demand; with a car of this class this is almost superfluous. BMW gave their blessing to the treatment set up by Siegfried Steiner, on the 17th of July 1989, after only one week of direct preparation, the time had come that a crowd of ten people with eight cars crossed the Alps southward bound. A shooting period of three weeks, that means until the 9th of August, lay ahead of them. A product film was to be shot. Out of the most interesting pictures the "EMO"-Trailer (Emotional Trailer) for the exhibition was to be produced, with the enchanting background music of Frank Duval. This may sound very simple, however, realistically seen it is quite complicated. Siegfried Steiner: "When do you decide which pictures are especially good? In general, you only film good and interesting subjects anyway. The ideal procedure to shoot everything in the 70 mm-format was of course not feasible because of the budget." The cameraman had an additional way of looking at the problem: "When you look through the finder of a 35 mm camera and then through a 65 mm-camera, you see two different worlds. That is a dream!" The solution of our problem: We always started shooting the 35 mm and then the 65 mm-version. For this it was necessary to slightly change the sets. The format made all the difference: "The big format gives you many more ideas...The brilliancy of the viewfinder alone is enormous." Camera car with camera arm on the roof. Frame grab from VHS tape. We always drove in a convoy of about eight vehicles, all in all approximately 4800 kilometres. Our star, the "850i", was unloaded six to seven times daily. The team didn't know exactly in advance when and where a certain scene was to be shot. Of course, a production manager had been location-scouting ahead of the team, however, he only selected the scenery in general. 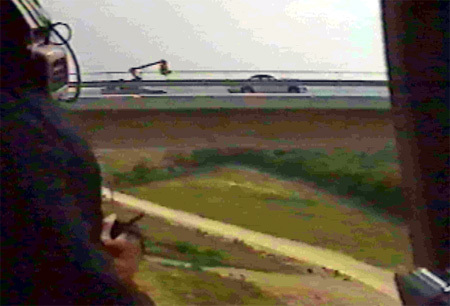 The scouting was supported by a helicopter. "Most of the ideas for the settings came during the trip when all of a sudden we were inspired by the scenery, a building or the 1ight conditions." "The final creation of the film", Steiner added, "is done to a great deal in the editing room anyway, as is well known". In this case it was the editing table of Verena Böckler. During the entire period the film crew was accompanied by an ARRI-technician-team from Vienna, in order to obtain first practical experiences under rough shooting conditions. Also the ZDF accompanied them part of the way, shooting a documentary about the production. It was in the height of the summer and the main vacation season in Italy, so it was not quite easy to shoot always and everywhere. Siegfried Steiner: "We are used to shoot a lot in France, about 80 percent, but for me, Italy is the total hypercountry". The police are more than friendly and the people very obliging. We stopped our convoy on the main street, even without permission. The police immediately controlled the traffic. We never experienced any problems from that side." "Certainly it was an advantage that we had hired an Italian production manager for this venture. Furthermore the person up there who controls the weather was on our side: During the entire three weeks shooting period we had only one day of bad weather." 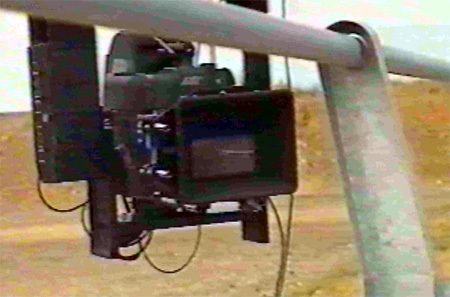 ARRI 765 camera on camera arm. Frame grab from VHS tape. "We used the video assist only for those settings when the cameraman was not able to look through the viewfinder, like for certain drive- and helicopter-shots. In the beginning we expected a major problem with the 65 mm-equipment like dolly, jib-arm, crane, Hot-Head etc. because this gear was designed for 35 mm-cameras." The question was: "Will the crane break or not?" Much to our surprise it didn't! After all, the "756" weighed almost double as much as its smaller 35 mm-brother. For using the ARRIFLEX 765 on the motion control small modifications had to be carried out like drilling other holes for the holding devices. This job was done by the ARRI-technicians from Vienna who carried out fast precision work. In addition the U-shaped holder of the Hot-Head had to be widened with a spacer to accommodate the "big" "765". After we found out that the jib-arm carried the weight without problem we didn't install additional supports which would have limited the mobility. This configuration was even used when we crossed a bridge. In this set-up the camera was hanging on a three metre long jib-arm outside the bridge-rail over a 150 m precipice, and we drove at a speed of about 80 km/h. That was when the ARRI-technicians felt sick; no wonder, but you can't make something out of nothing! Camera car with camera arm on the roof and BMW seen from helicopter. Frame grab from VHS tape. Otherwise the camera was very rarely on a tripod. On the most part it was lying on wooden boxes, standing on the floor or hanging upside-down in a special suspension. As expected, it stood up to all this without problems. And for the case that the worst would come to the worst we still had our ARRI-technicians from Vienna. The camera even proved to be quite resitant to water. The "765" proved to be very "eager for action". It also proved very handy to operate and compact. 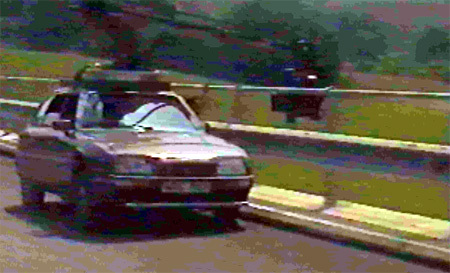 Siegfried Steiner and second cameraman, Peter Karl, were also able to shoot inside the running car without space problems. Handling with respect to measurements could be compared with the 35 mm-camera. The handling of the optics was not so familiar. Siegfried Steiner is used to pull the focus always by himself, even with long focal lengths. "I can't tell you why, you have to have a feel for that." According to Steiner he ran a bit into trouble in the beginning. The reason was that the depth of field is very low. "If you just turned a little bit, the image was immediately out of focus." However, this problem existed only for a short time, even though they often used a range extender which complicated the matter even further. In general Siegfried Steiner works with two focal lengths only. Since the macro-lenses are not yet available for the "765" and the normal lenses could not be used for distances below 170 cm, close-ups proved to be very complicated. This distance was still too total for cameraman Steiner. Much to the surprise of the ARRI-service-team he used a little trick with close-ups: He removed the lens from the mount, attached it on a tripod about 30 cm in front of the camera and covered the space in between with a black cardboard box. The whole design looked like a bellows. Now he was even able to cover a film frame with a peg for tuning a violin. So it could happen that the lens was lying on a table with the camera a few centimetres behind. Siegfried Steiner: "The shots turned out beautiful". He always used the smaller magazine (500 ft) which, for reasons of weight reduction, he usually loaded with 60 m film-stock only. Whenever it was more, his assistant helped carrying the camera. "For shoulder operation it is a bit heavy", says Steiner about this newcomer, however, he is convinced about its handling. You can imagine how many times they had to change the magazine when the "765" was sometimes running at a frame rate of 80 fps or even 120 fps! The latter speed was only possible after a little technical ARRI-service-manipulation. All in all they used about 4500 m of 70 mm-film-stock and about 8000 m of 35 mm-film-stock (Kodak 65 mm-negative 5247 and 5245). Due to their excellent contacts in the USA they had no problem obtaining the film stock. According to Steiner-Film the additional cost for the 65 mm-format as compared with the 35 mm-format is not so significant. A major problem however was that, except developing, no post production could be done in Germany. Neither master nor duplicate prints could be made here. So, post production was done by Deluxe in Hollywood and Steiner-Film was lucky to get delivery just in time before the exhibition. Nevertheless, this venture into new territory was worth it. When asked whether he would work again with the new ARRIFLEX 765 Siegfried Steiner replied with a clear "of course!" "The absolute best of all, however, was the catering", gourmet Steiner who is known to his friends for his culinary passion said smilingly. Viva Italia!